It's been quite a while since I've done a Skunskworth's Barleyslime post, but how fitting to have it right on one of the most humid days this summer.. so far. I always say that no brewery can have only amazing beers, even the best breweries on the planet are bound to have piss poor products once in a while.. even if the brewery ends up drain pouring it themselves. Big Rock Brewing has been mostly miss for as long as I can remember. If I was comparing macro beers, Big Rock would be one of the better big breweries in Canada, but since they are still considered a microbrewery in this day and age.. they have a lot of products that I wouldn't waste my time checking out. With all that being said, summer is here - that means bonfires and camping. When I'm camping I don't like to bring a 12 pack of Unibroue.. I always tend to pick up a 12 to 15 pack of a lager or pilsner in cans. 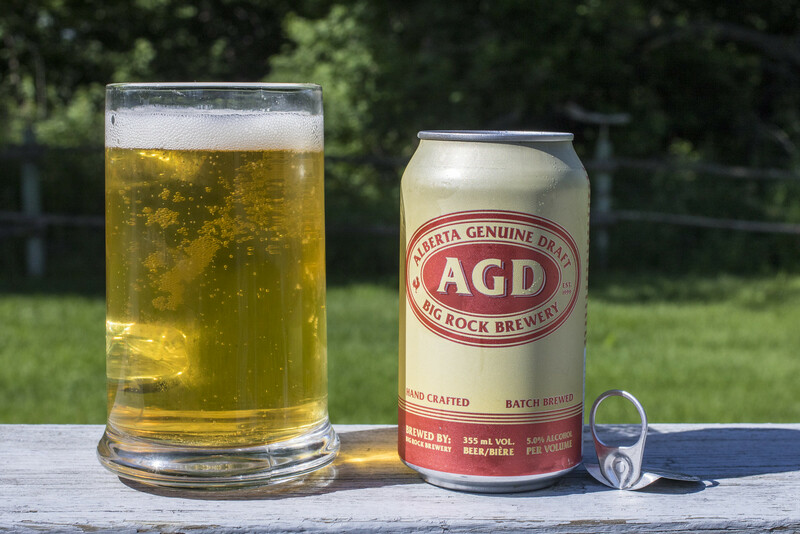 When I first heard about Alberta Genuine Draft several years ago, the label alone made me cringe thinking that it was a Minhas product. 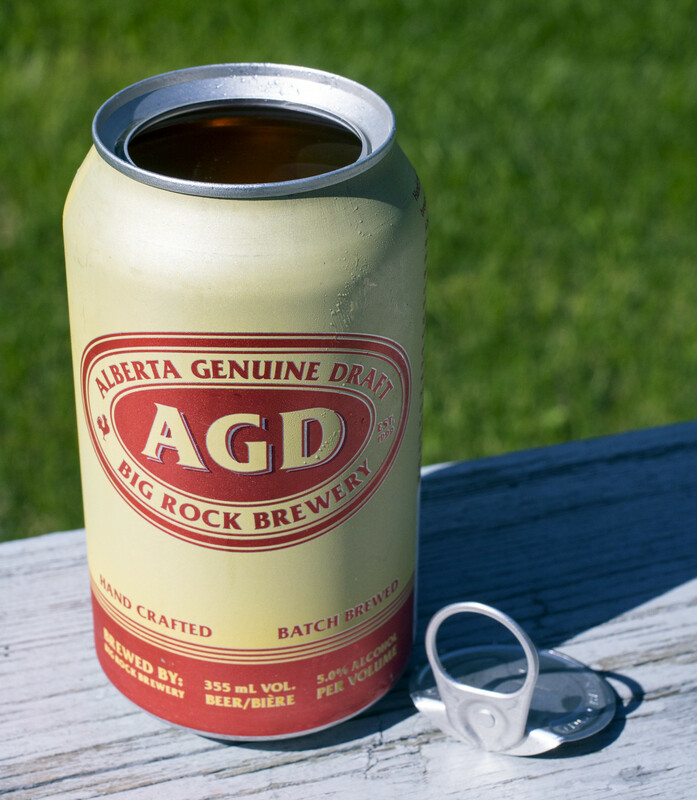 Now, Big Rock revamped the product design to have an appearance that's reminiscent of the 1970s with a pop top that turns the can into an aluminum glass.. pretty cool, but at $21ish per 15-pack, the beer left a lot to be desired. The appearance is your typical Canadian prairie adjunct lager, a very pale straw yellow, minimal foam and a slight bit of fizz to it. The aroma might as well make it a Minhas product - it's giving off creamed corn, a strange vegetal aroma to it and to top it all off, way too sweet. The flavour is pretty much how it smelled, the cream corn really pops out there, little to 0 hop presence and I'm getting a light medicinal yet metallic aftertaste that lingers momentarily... thank goodness not for long. To top it off, it attracts all the bugs to the yard. Right as I was about to go in for another sip, there was a massive fly in it. 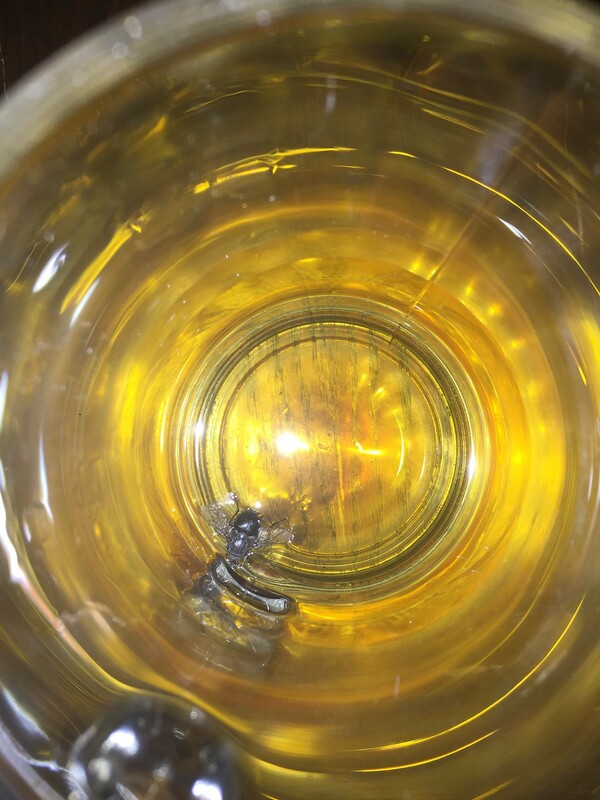 I hope the fly enjoyed the beer more than I did. If it was 5.5% rather than 5.0%, I'd give it some leeway, but for the most part it's just Alberta horse piss. Ha! Actually, with everything I've stated, this is actually tastier than: Coors Light, Kokanee, Bud Light, Budweiser, OV, Club and Labatt Lite. So, that's a plus I suppose.